Claire Desroches is a personal trainer who trains in Brazilian jiu jitsu, although she has previously competed in Thai boxing and kickboxing. She writes about veganism, health and fitness at Great Vegan Expectations, and runs her own training company, Great Expectations Fitness. There was a very clear moment around the age of 15 when I couldn't face eating dairy – it just seemed wrong to be putting it into my body. It was only later that I understood that we have no right to mass farm animals of other species, and that we have no need to consume so many animal products. I would class myself as an ethical vegan, but my views lean slightly towards the philosophical side of things. Over 4 years. I did first go vegan at that moment when I was 15, but I only kept it up for about a year because of the social pressure of constantly having to explain myself to other people. In between that time I did follow a heavily plant-based diet, but I count myself as being vegan from the age of 19. I have learnt so much about health, cooking and nutrition, and about my own body. It has probably saved me a lot of money too. Taking responsibility for my own health and for leading a compassionate and sustainable lifestyle. I take part in Brazilian jiu-jitsu classes (gi and no-gi), which involve drills, techniques, and sparring. I supplement that training with weight lifting, various forms of cardiovascular work, and conditioning sessions. I generally train five or six days a week – usually four days of martial arts classes, and one or two days dedicated to conditioning work. Yes, I am a personal trainer. I don't play any organised team sports, I let my playfulness and competitiveness out on the mats during sparring. That we are all militant, “alternative” types who either know nothing about health and fitness and live off boiled potatoes, or that we are crazed new-age health fanatics who live off expensive raw super foods. Because of the high levels of vitamins, minerals and antioxidants present in a plant-based diet, I find my immune system is stronger than that of my non-vegan training partners. My blood sugar levels are more stable throughout the day and I am more focussed and alert. Combating misconceptions and misinformation about healthy eating and a balanced lifestyle. Surprisingly so! So far everyone I have encountered has been very respectful of my diet, and often curious to find out more and to try my food. Yes, and I feel incredibly lucky to be surrounded by a network of open-minded and respectful individuals. My family regularly try out new vegan recipes when I visit, and my friends are always happy to visit vegetarian and vegan places with me. It's always about how and where I get my protein from. I normally explain that I do take protein supplements, but purely for the convenience, as do many athletes and gym-goers. If they seem curious, I go into more detail of my recommended protein requirements and my current protein intake, to reassure them that I do know what I'm doing. 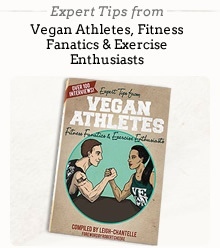 The thought of other vegan athletes out there achieving great things is great motivation. Also, the feeling of being part of a worldwide team and community who all fight for a common purpose. Breakfast – soy yoghurt with fruit, seeds, nuts, cinnamon and agave nectar, or porridge with banana, cinnamon, and nuts, nut butters or seeds, if I'm after something heartier. Lunch - if I'm at home and have a well-stocked kitchen, often a big salad loaded with colourful tasty ingredients like avocado, sundried tomatoes, and toasted seeds; or it could be an oven-baked sweet potato with scrambled tofu. Often I'll just graze throughout the day on whatever I feel like. Dinner – this is usually my first post-training meal and quite late in the evening, so I'm after something quick, full of nutrition, and easy to digest; usually a spicy collection of vegetables with tofu, tempeh or vegan mince (could be grilled, sautéed, braised, or stir-fried depending on my mood and hunger levels), often drizzled with tahini and hot sauce. Snacks (healthy & not-so healthy) – lots of fresh fruit, occasionally dried fruit, almonds, Brazil nuts, soy yoghurt, and dark chocolate. Oats, dark chocolate, fresh and dried fruit. Along with protein shakes, I take a daily multivitamin, Iron, and occasionally B12 or vegan D3 when I remember to buy them. Gaining muscle - Focus on developing strength in your big muscle groups by building your programme around compound exercises like squats and bench press, eat heartily and often, ensure you are getting protein and carbohydrates into your body within 30mins of training, limit steady-state cardiovascular workouts, and be sensible with your recovery and sleep. Losing weight - Mix up your programme with interval training, steady-state cardiovascular endurance work, try to go for a walk or a light jog before breakfast and after dinner, drink plenty of water and green or oolong teas, avoid high sugar foods before bed, get plenty of sleep. Identify your cravings and make sure you're not just eating out of boredom. Maintaining weight - Listen to your body. Stay active, enjoy your training, eat a varied diet full of colours and textures and flavours, take time to stretch and unwind and spend time with friends and family, enjoy life. Improving metabolism - Build muscle by lifting weights, mix up your training programme, work on increasing your power and explosivity, drink green tea and oolong tea, stand and walk whenever you can. Toning up - Focus on building up full-body strength with bodyweight exercises like pull-ups, chin-ups, push ups, planks, and progressively build in more explosive exercises like squat-jumps and burpees. Fill up on lean protein, stay active throughout the day, drink plenty of water, and pay attention to your sleeping pattern. Mainly I just try to stay healthy and happy, I train hard and stay fit and strong, enjoy a varied diet with its fair share of treats, engage in social activities with other vegans, cook for friends and family and take them out to vegetarian and vegan restaurants. I aim to be respectful, inspiring, and lead by example. Find your nearest martial arts gym and just give it a go. Remember we are not born lean, strong, explosive, and technically skilled, and the most advanced people always remember what it was like to be a beginner. Leave your comfort zone at home - it will still be there when you finish training.